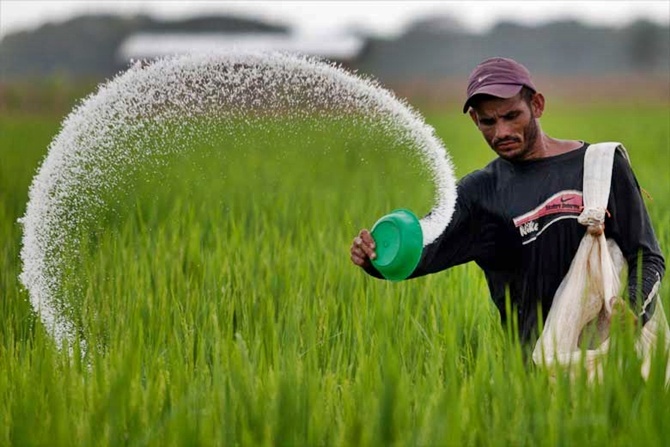 The agriculture ministry plans to dovetail its ambitious programme of providing irrigation to each field with the rural employment guarantee scheme to ensure smooth availability of labour. Officials said discussions have started between the agriculture ministry, which the Pradhan Mantri Krishi Sinchaee Yojana oversees, and the rural development ministry, which looks after the Mahatma Gandhi National Rural Employment Guarantee Scheme. MNREGS labourers are usually engaged in irrigation projects -- one of the main focus of the scheme -- but a formal arrangement does not exist, officials said. Dovetailing the irrigation programme with MNREGS would ensure that work done under the PMKSY gets paid through the job scheme. Officials said the proposal might also be discussed with state representatives at a conference with the central government, in Sikkim on January 17-18. Prime Minister Narendra Modi will inaugurate the conference. States would play a vital role in implementation of both the schemes. Modi had at a review meeting on the irrigation scheme last year talked about dovetailing both schemes. The linking would also ensure availability of adequate hands for agrarian work. Rural India had seen a shortage of labourers for agriculture work after the rural job scheme was rolled out with a guarantee of minimum 100 days of paid employment. The PMKSY, launched last year with an allocation of Rs 50,000 crore (Rs 500 billion), would amalgamate three major irrigation programmes of the Centre for holistic development. The programmes that would be bring under one roof are the Accelerated Irrigation Benefit Programme of the ministry of water resources, Integrated Watershed Management Programme of the ministry of rural development and land resources and the On Farm Water Management component of the National Mission on Sustainable Agriculture of the agricultural department. In the 2015-16 Budget, Finance Minister Arun Jaitley had allocated Rs 5,300 crore (Rs 53 billion) for the programme. Out of this, Rs 1,500 crore (Rs 15 billion) would be spend by the rural development ministry to develop rainwater harvesting structures, small check-dams and contour buildings under the watershed management programme. About Rs 2,000 crore (Rs 20 billion) would be spend by the water resources ministry for ongoing projects under the accelerated irrigation benefit programme and also for construction of field canals. Another Rs 1,800 crore (Rs 18 billion) would be spent by the department of agriculture for developing water harvesting structures, etc. According to official data, around 46.34 per cent of India’s net sown area of around 140.80 million hectares was under irrigation cover till 2011-12. In 2000-01, around 40.5 per cent of net sown area was under irrigation, a rise of around 5.8 percentage points in a decade. In crops like oilseeds, pulses and coarse cereals, data show that of the total area under cultivation the areas under irrigation were only 26 per cent, 16.2 per cent and 14.4 per cent, respectively. Dovetailing the same with MNREGS would ensure that work done under the PMKSY would get paid as MNREGS labourers. Modi's rendezvous with 40 start-ups: What's in store?